Alcat Water Services is a SNIPEF licensed plumber in Uddingston, North Lanarkshire, available for every type of plumbing, central heating, gas installation, bathroom installation, maintenance and repair work anywhere you need a plumber in Lanarkshire, Glasgow, the west of Scotland and nationwide. 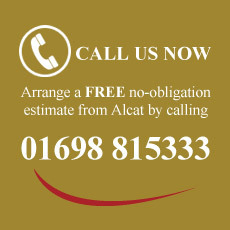 From simple domestic plumbing repairs and installations to large commercial contracts in office, pub, restaurant, school, shop, superstore and Ministry of Defence environments, Alcat Water Services is always ready to provide compliant and professional tradesmanship of the highest certified quality at competitive and affordable prices. Based in Uddingston, North Lanarkshire on the convergence of the M8, M73 and M74 motorways, we are available to serve as a domestic and commercial plumbing contractor in Lanarkshire, Glasgow, Edinburgh and all across Scotland and the north of England. Safety and standards compliance is our top priority. In addition to being SNIPEF licensed, we are on the Gas Safe Register and CLE Licensed to Trade. You will always have peace of mind in work carried out by us as being safe and of a reputable standard.